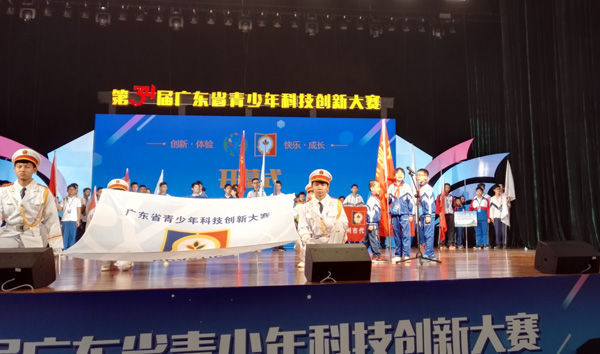 On the morning of March 30, the 34th Guangdong Adolescents Science and Technology Invention Contest, opened at the Ofei Civic Plaza Concert Hall in Chenghai District, Shantou with the theme of "Innovation, Experience, Happiness and Growth". For 34 years, it is the first time for such an annual grand meeting of technological communication to be held in the eastern Guangdong. The contest has gathered over 500 students from 22 teams, submitting over 1107 projects in the final evaluation. Meanwhile, the first prize project of innovations of tutors, excellent award in scientific and technological practice project and science-fiction paintings of children and adolescents in the province were specially exhibited. 22 special awards was established and presented to the excellent projects, the premium of which will be representing the Guangdong Province to participate in the 34th China Adolescents Science & Technology Innovation Contest to be held in Macau. Copyright by The People's Government Of Shantou City. All Rights Reserved.